kindly note , our remote is the COMPATIBLE / REPLACEMENT /CLONE remote , not the original one . please make sure your remote / system can be used before buying . Press the LOCKNO.A/NO.1 and UNLOCKNO.B/NO.2 button at the same time ,and the LED indicator will flash 3 times then off. After this ,keep and hold the LOCKNO.A or NO.1 and release the UNLOCKNO.B or NO.2 button and press the UNLOCKNO.B or NO.2 button 3 times ,the duplicator led indicator will flashquickly , that means it remove the exist code successful. Now you can come to the next step to copy now. Pls take the original remote and duplicator as close as possible. 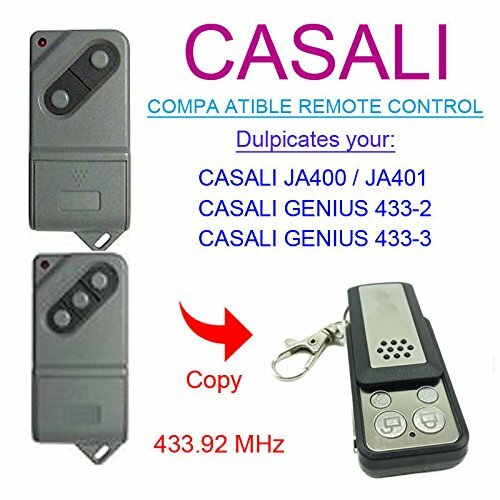 Then press one of button from original and one of them from duplicator at the same time, you will see the led indicator fast flash ,that is too say you copy original remote successful.